WHAT ARE HORSE FLIES & DEER FLIES? Horse flies and deer flies are large flies known for their painful bites, and belong to the family Tabanidae. 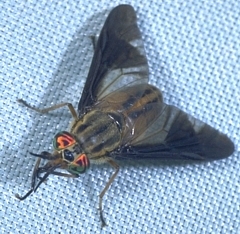 Most horse flies and deer flies are at least as large as house flies, and generally have a similar shape as house flies. Horse flies and deer flies can be distinguished from house flies and other flies by their unusual antennae (shown below): all horse flies and deer flies have 3 antennal segments, with the 3rd segment long and conspicuous. Like all flies, horse flies and deer flies have only one pair of wings and have mouthparts adapted for sucking. 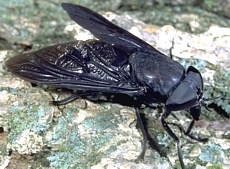 Common horse fly and deer fly species have brown, gray, or black bodies, and most have dark-colored or patterned wings. Horsefly and deer fly larvae are legless and resemble large maggots. SIZE: Adult body length up to 1 1/8", larvae up to 1 1/2"
Like all flies, horse flies and deer flies have complete metamorphosis with egg, larval, pupal, and adult stages. 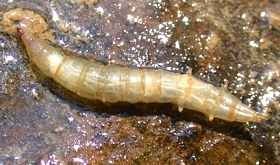 The larvae are legless and maggot-like, and most species are found in water or moist soil. After growing for 1-2 years (spending the winters as larvae) the larvae pupate in spring and emerge in early summer as winged adults. The adults usually live for only a few days. Females of most species lay eggs on aquatic plants that rise just above the water surface. Adult horse flies and deer flies are commonly found near aquatic habitats where their larvae develop. Female horse and deer flies feed on the blood of large mammals, including livestock and humans. Male horse and deer flies feed only on nectar. Larval horse and deer flies are predators, and they usually live in ponds, streams, or moist soil. They feed on a variety of aquatic invertebrates, including mayfly and dragonfly naiads, stonefly larvae, caddisfly larvae, crane fly larvae, snails, and aquatic worms. Large horse fly larvae will sometimes capture and feed on small vertebrates, including fish and amphibians. 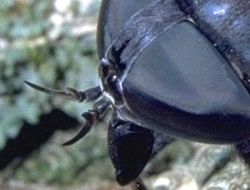 Larvae feed by sticking their head capsule completely inside prey and sucking fluids and internal organs. 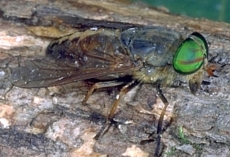 Most of horse flies found in Kentucky belong to the genus Tabanus. Adults are typically 1/2" or larger, up to nearly 1 1/4". Most species are mottled-gray or black. Deer flies are typically smaller (1/4" - 1/2") than horse flies and usually have patterned wings. Horse flies and deer flies are commonly found near ponds and streams during the summer in Kentucky, especially around farms where livestock is kept. Horse flies and deer flies are strong fliers, so a butterfly net (also called an "aerial net") may be needed to capture one. Larval horse flies and deer flies are common in ponds and streams, and can be collected with aquatic insect nets. Photographing horse flies and deer flies can be difficult, but they will sometimes stop and rest on flowers and leaves, and will remain still if you approach slowly with a camera. Although most flies have mouthparts adapted for sucking, female horseflies are able to cut into flesh with their knife-like mouthparts. Do you know any myths, legends, or folklore about horse flies or deer flies? If you do, let us know!